The 216th Big Break Jungle Surf Tournament is about to begin, and you are the only human who's been invited. Click here to play! As each contestant represents their species in the race, you are here to act as an impartial judge. None of the different jungle creatures trusts one another, so they leave it to you to pick the winner. Of course, animals aren't hard to fool, even when they can talk and surf. While most of the competitors are primates of some kind, they still haven't got the brains of a human. This makes the Big Break tournament an incredible betting opportunity for a crafty human judge. Sure, the animals mostly just have bananas to gamble with, but with the price of bananas going through the roof, you can surely cash in your winnings for a fortune at any friendly grocery store. It may be dishonest to fix the results of a fair competition when you are the judge, but are a bunch of monkeys really going to care about losing a few bananas? ...Well, you'd better hope they don't, or else you could find yourself without a leg to stand on. Not in court, mind you, just literally with your legs ripped off. By a monkey. 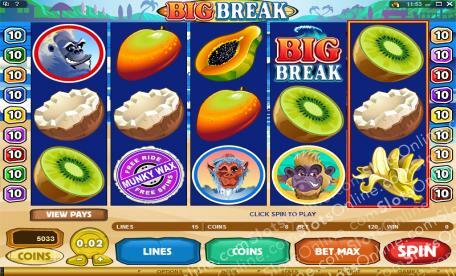 Play the Big Break slots now to cheat the monkeys out of their hard earned bananas and to watch some crazy monkey surfing action. Just don't get caught with their bananas. There are many scatter symbols. First, the Munky Wax symbols give 15 free spins and pay bonus money based on the total bet. Secondly, when all the surfers are featured anywhere across all 5 reels on a single spin, a bonus is triggered. Two wild symbols are used: the Lucky Break that substitutes for everything other than Big Break and Munky Wax symbols, and the Big Break symbol that only substitutes for surfer symbols. The Lucky Break symbol only appears on reel 5 and completes right to left pays only. The bonus is triggered when each of the different surfer symbols appears across the 5 reels on one spin. In the game, you must try to stop the light on your favorite surfer, you will then be awarded a prize based on that surfer's payout multiplier.